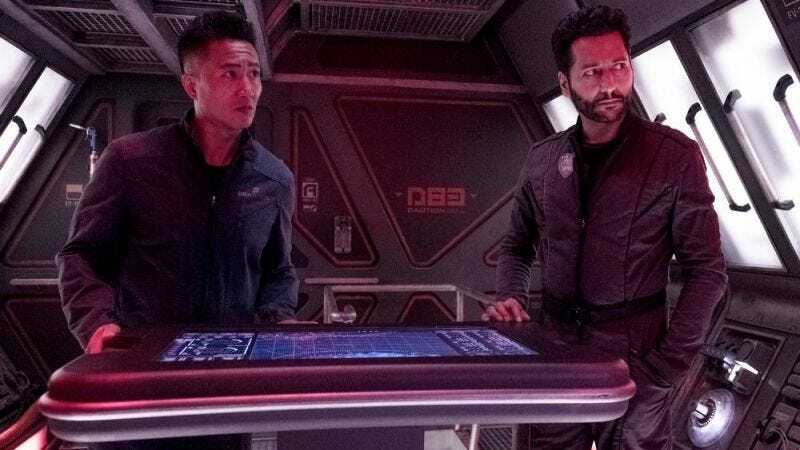 Prax (Terry Chen) and Alex (Cas Anvar) from the highly acclaimed scifi series. The Expanse will need to find a new home, because Syfy has chosen to end its relationship with what’s widely regarded as one of the best science-fiction shows on television. Deadline cites broadcast rights as the probable cause for the cancelation because Syfy can only show The Expanse on a live, first-run basis in the US and has no option for digital or streaming platforms. The article also says that The Expanse’s ratings are below those of other Syfy shows like The Magicians and Krypton. But there’s a slim chance that The Expanse may yet live on. Alcon, the production company that makes the show, says it’s going to shop it around. One would think that today’s acquisition-happy market—where Netflix, Amazon, Disney, and Apple are all dreaming of streaming-platform supremacy—means that The Expanse won’t be homeless for long.